Beit Shemesh mayoral candidate claims hareidi flyer that quotes Scroll of Esther incites violence. 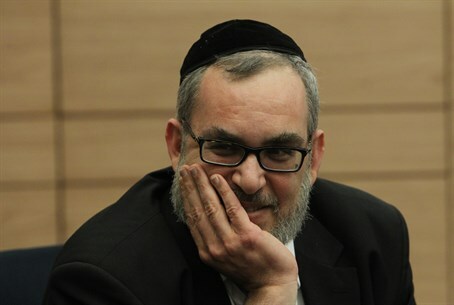 A shrill argument broke out Monday in the Knesset's Committee for the Interior between Eli Cohen, the Zionist candidate for mayor in Beit Shemesh, and hareidi MKs. At the center of the argument was a flyer that Cohen said was distributed in Beit Shemesh, and which contained thinly-veiled incitement against him. Taken in its entirety, Cohen explained, the verse constitutes grave incitement against the secular public, calling on the hareiem "to kill and annihilate" their rivals. MK Yaakov Asher (United Torah Judaism) would have none of this. He blasted Cohen for “completing a verse” instead of quoting only what was written, and accused him of being a provocateur.